The Committee is required by clause 11.3 of the Māori Party constitution to “act swiftly” to seek resolution of the complaint, in accordance with the kaupapa of the Māori Party and its constitution. 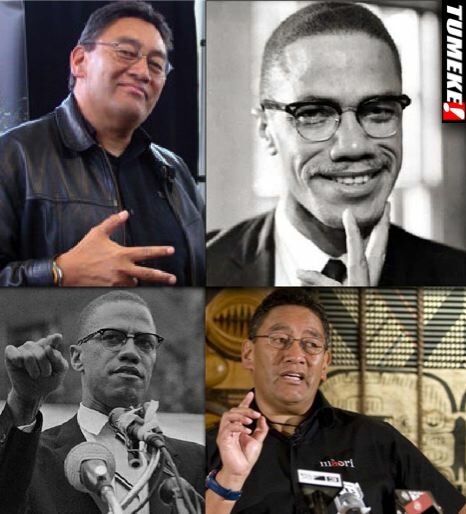 Accordingly, with great sadness, and after many hours of deliberation, a quorum of the Committee resolved unanimously that the complaint was not resolved at the hearing or at any of the previous hearings, and that there did not appear to be any way of resolving the complaint besides cancelling Mr Harawira’s membership of the Māori Party. Under clause 3.7 of the Māori Party Constitution, the Māori Party National Council is the only body capable of taking a decision to cancel Party membership. The Committee has therefore referred the complaint back to the Māori Party National Council, together with a full report of its resolution. The Chair of the Committee will be briefing the National Council when it meets on Wednesday and go through all of the responses and evidence submitted by the parties. But Te Orohi Paul [Disciplinary chair] will not vote at the National Council. The complainant has been advised of the outcome, as required by clause 11.4 of the Māori Party Constitution. 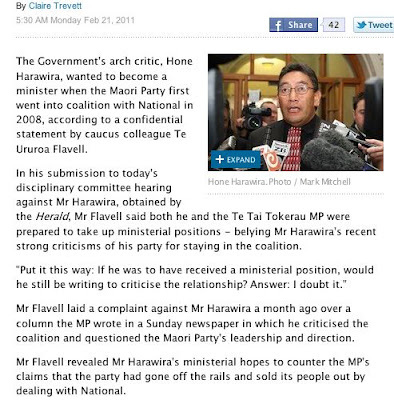 Mr Harawira has also been advised of the outcome. Hone didn't help his case when he went on TV, he didn't help his case when he avoided a hui at which he was expected; but he is not the only one playing games here. The National Council is due to do the deed today; I'm not sure if the Christchurch earthquake is going to change that timeline. With the hierarchy aligned against him (and Hone's inability in his situation to mobilise the flax roots national membership effectively to rally to him) it's a fait accompli - he's gone. I doubt the executive have considered properly what the next move is though. The Tai Tokerau electorate branches will remain staunchly behind Hone and there seems little likelihood a Maori Party candidate running against Hone would win - they would probably come third behind the Labour candidate and it would be hugely embarrassing. With a wholesale defection to the new organisation that Hone will be forced to form the Maori Party up North will be gutted and the party vote will show that come November. If Hone forms a party that stands in the other Maori electorates then Labour could come through on the split vote quite easily in Te Tai Tonga and probably take out Pita Sharples in Tamaki Makaurau (that will let Shane Jones in), and Te Ururoa Flavell's Waiariki electorate will be highly marginal (as he will quite rightfully be blamed for the split). Perhaps only Tariana will survive - and with the party vote dropping from two and a half to maybe 1.5% there may only be two Maori Party MPs in the next parliament. That's all if Hone's party stands in those electorates. I have suggested in an earlier post that an accommodation ought to be found between the two forces in order to preserve the electoral chances of both Hone and the Maori Party and therefore maximise the kaupapa Maori representation. The pact would exist for this election only: the Maori Party agrees not to stand in Te Tai Tokerau and Hone's party agrees not to stand in the other Maori electorates (or perhaps just not in the ones where his colleagues hold their seats). If these things are not done the Maori Party may well destroy itself and Labour will creep back in. As for the disciplinary process and the way Hone's internecine assassination has been conducted it has been a messy spectacle with no discernable winners. 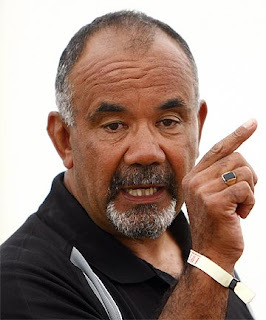 Te Ururoa Flavell - the exasperated whip who was compelled to officially complain after Hone went too far in a Sunday paper article - has done himself few favours. His motivation to expell Hone is conflicted because he is the major beneficiary of his demise: he will be the next male leader now that he has gotten rid of Hone. This clash of egos and career ambitions has been underplayed by the media who have not recognised that this is a leadership dispute between the two men. Te Ururoa's way of winning that dispute has undermined unity more than ignoring it would have done and he may well end up the leader - but of a diminished party having given rise to a movement that may destroy it completely in the long term. While I have sympathy for Te Ururoa's initial actions his hatred of Hone has gotten the better of him and leaking documents to the NZ Herald, as he did, makes him look a hypocrite. A hypocrite and a bully with a personal agenda. The President says Hone isn't allowed to talk to the media about it and nor is anyone else, and yet here is Te Ururoa launching a smear campaign via the Herald - and he gets away with it? Where is Te Ururoa's displinary hearing? One rule for Hone, a lesser rule for Te Ururoa. How can that be right? The "ministerial hopes" may come as a shock to the rest of the media, but this is what I have been saying: Hone seeks leadership and responsibility and is not content with being a maverick always on the outside looking in. Te Ururoa has confirmed this, and then implies it means Hone would have backed National to the hilt in the same way that they are - that is merely his own speculation and tainted with all the bias of someone threatened by an opponent. left the Labour Party over the first Foreshore and Seabed Act. "She is comfortable enough to support this [latest] bill. If it is that Hone is so vehemently opposed, then surely a belief in that principle would result in his walking as well." Mr Flavell indicated things were past the point of no return, saying the other MPs "have lost any semblance of trust in Hone and clearly, he in us." "I am clear that more hui with Hone or an electorate will not change things. He is his own man." Hone is his own man - of that everyone agrees - the question he begs however is who owns him? If the Maori electorates want to vote for sell-out kupapa types in it for the limos and the luncheons and willing to compromise every shred of principle just to stay in a green leather chair then they will vote Labour because at least with Labour - for all their faults - there is an iron-clad, tungsten-core guarantee they will never go with National. And in the meltdown the party votes will flow to the Greens. If Te Ururoa wants to hold his own electorate then he must address these concerns and at his next foreshore and seabed meeting (scheduled for Monday) I intend to make sure he does. I am voting Labour and Greens next election, no way shall the National party continue their assult on people who really need the welfare as they are unable to work due to their health. For example if I go for a 15 minute walk I end up in bed for 3-4 days to recover as I have Chronic fatigue Syndrome and if I do any mental activity lets say talk to someone longer than 10 minutes I will start to fall asleep on the spot. This is all while John Key is living it up in his big mansion partying racking in all the money, PEOPLE FIRST, PEOPLE SHOULD ALWAYS COME FIRST!!!! I find the 'with great sadness' stuff in the Maori party statement to be insulting. It is we who had high hopes for the Maori party who feel the sadness, I'm not sure anymore what they feel.